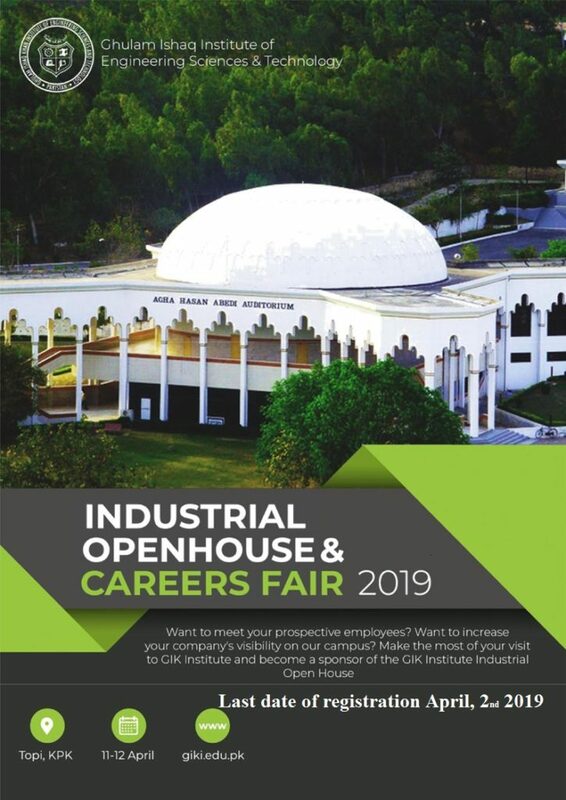 Bahria University Islamabad Campus is organizing Career Expo Spring 2019 on 24th April 2019, Wednesday. This one-day free of cost event is strategically designed to introduce you to top-notch candidates of Bahria University who are looking for employment opportunities. The Expo will provide multiple innovative ways to brand your organization with students, alumni and faculty of Bahria University Islamabad. In Spring Session Bahria University offers Graduate and Post Graduate programs in disciplines of Management Sciences, Computer Sciences, Software Engineering, Computer Engineering, Electrical Engineering (Telecom, Electronics, Power) Social Sciences (Media Sciences,Development Studies & IR),Law (LLB), Earth & Environmental Sciences (Geology and Geophysics) and Professional Psychology. This entry was posted in Announcements on April 10, 2019 by waheed. The final year projects exhibition is the main event to be held on April 11th. Major activities are going to be held on the same day. If interested, April 12th will be reserved for interviews of graduating students. An overnight stay on shared basis can be arranged for a maximum of two guests** intending to conduct interviews on April 12th. Accommodation will be provided on a first come first serve basis due to limited space in lodging facilities. Please complete the Online Registration Form or the enclosed Registration Form and email or post it back to us as soon as possible. The last date to register is April 4th, 2019. **More than two officials may be accommodated on payment subject to availability of accommodation on campus. For sponsors, please consider one of the Sponsorship Packages outlined in the attached documents. For further information about the event, please CLICK HERE. Looking forward to your participation in the event. This entry was posted in Announcements on April 5, 2019 by waheed. We are pleased to announce our partnership with National Business Education Accreditation Council (NBEAC) – HEC for 5th Deans & Directors Conference 2018. NBEAC’s Deans and Directors Conference annually brings together more than 100 deans and directors of business schools for strategic level discussions. This year’s conference will focus on the balance required between global paradigms versus the need to customize business education in Pakistan according to the local needs. Both businesses and business schools in Pakistan – small or large, urban or rural – face competition for products and services created by the spread of information technology and globalization. However, our context, culture and heritage demands a certain degree of indigenization in management practices and in business education. The conference program is designed to increase the effectiveness of business education in Pakistan, through debate on the mentioned issues and through related refinements in the accreditation process. To evaluate the extent to which business education in Pakistan is preparing graduates to contribute to the local and global economic activities. To identify unique themes and specializations for business education in Pakistan, keeping local needs and global trends in perspective. To discuss the balance between indigenous vs. international curriculum content for effective business education in the country. This entry was posted in Announcements and tagged CPEC, Deans & Directors Conference, hec, Higher Education, nbeac on November 22, 2017 by waheed. ‘Certified Success Coach‘ is Pakistan’s most respected Coaching Certification Program. 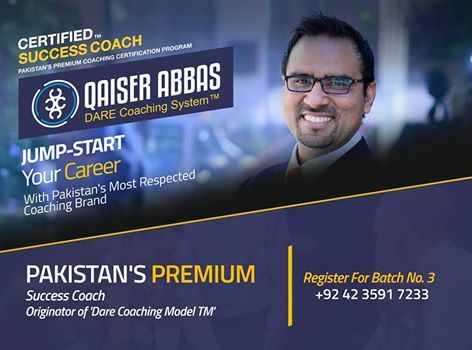 The program is led by Pakistan’s Premium Success Coach, Qaiser Abbas(www.qaiserabbas.org) Possibilities (www.possibilities.net.pk) is on a mission to establish country’s largest Coaches Network capable of delivering first-class results. Our coaches are passionately serving the society by offering FREE coaching sessions as part of their coaching certification requirement. So far, some 1,250 people from various walks of life have been coached by our under-training coaches using ‘Qaiser Abbas Dare Coaching System™’. We aim to reach out to 3,750 people with our complimentary coaching sessions by the end of 2017. In each program, we develop 25 coaches. These 25 participants are selected through a three-step rigorous process on pure merit basis. In the first program in January 2017, we received 900 applications. In the second one in February, over 1500 candidates applied. In both programs our team selected 25 best of the best participants to work with Qaiser and his coaching team. THREE months application of coaching methodology with 25 coaches under the supervision of Qaiser’s coaching team. Seeing the phenomenal success of the first two batches, we are launching the 3rd Batch in May 2017. We are on a mission to build quality coaches to create awareness of coaching in Pakistan. It is worth sharing that the program fee is heavily subsidized by Possibilities. Yet, many people who get selected through a transparent process, are not able to afford the course fee. In the last two programs, in addition to subsidizing the fee, Possibilities Foundation has also provided scholarships to 8-10 participants in each program to help them complete their certification. This entry was posted in Announcements on April 7, 2017 by waheed. Mustakbil.com Launches Job Search & Hiring App for Android Users. The most awaited Job Search & Hiring App is here! Mustakbil.com, Pakistan’s leading jobsite proudly announces the launch of its app for android users. With all the features of Mustakbil.com website, Mustakbil Job Search and Hiring App is a power packed tool for jobseekers and Employers alike. Mustakbil Job Search App is the best companion for your next big career move. With Mustakbil Job Search App, you are always one step ahead of the crowd competing for better career opportunities. Create your professional identity using industry’s best Resume Builder. Add photo to your profile either from your mobile’s memory or take a fresh one using your phone camera. Add life to your professional profile by adding your skills, educational qualifications, portfolio, awards and achievements etc. Manage your account setting with easy to use dashboard. Fast, easy and efficient Job Search, matching your career interests. Explore and Apply to Jobs that are hard to find otherwise. Apply to Jobs with a single tap. Share jobs with your friends on the go. Manage your Job applications in one place. Review all of your applications’ status i.e resume delivery, views, shortlisted, interview schedules etc. View details and respond to (confirm, request reschedule etc.) interviews scheduled by Employers. View and respond to messages from Employers. Never miss an opportunity; Mustakbil Job Search App keeps you updated with relevant Job alerts. Mustakbil Job Search App notifies you whenever your resume is shortlisted or an Employer schedules an interview for you. About Mustakbil.com – Destination for Job Seekers and a Perfect HR Solution for Companies! Started on October 07, 2004, Mustakbil.com is Pakistan’s leading jobs site. It helps jobseekers in finding the jobs of their own choice, while providing a unique platform for employers to advertise different career opportunities available in their organization and receive resumes from the potential candidates online. With our efficient and productive applicants’ management system, Mustakbil.com enables hundreds of Job placements each day. Mustakbil.com is known to be a reliable place to apply online for jobs, easy to use interface, fastest browsing experience and rich features set. That’s the reason we are able to gain and maintain the trust of the users of our website. 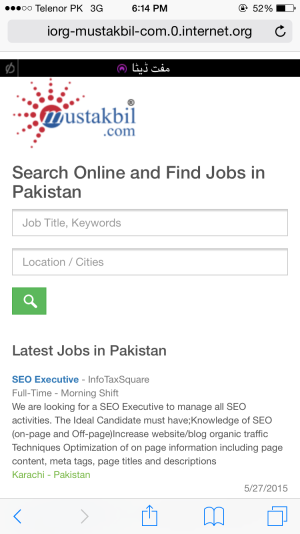 Mustakbil.com is a leading jobs site of Pakistan with over 65,000 employers and millions of active and engaged web users. This entry was posted in Announcements on January 12, 2017 by waheed. This blog entry is in response to a news item published in local newspapers that somehow includes Mustakbil.com in a list of websites not paying taxes to the regional tax authorities. It is deplorable that the news item was published without taking our point of view despite us being named explicitly in the said news item. We believe, it is necessary at our part to put things in perspective to make sense to our valued members and well wishers. On June 10th 2016, we received a notice from Punjab Revenue Authority (PRA) advising us to register Mustakbil.com for Sales tax on services. However, there were no allegations of tax evasion leveled against Mustakbil.com as one might takeout from that particular news item. Mustakbil.com is a brand of TechnoBird (duly registered with PRA); an active tax payer with compliance level 100%. All invoices for business generated through Mustakbil.com are serviced using business name “TechnoBird” and Sales Tax collected for the services is submitted to the government exchequer. We considered this notice an incident of miscommunication and immediately got in touch with PRA regarding the matter. An official response to the notice was duly submitted to the competent authority clarifying our stance. The matter was settled once we made available all the necessary information to the PRA officials. We take this opportunity to elaborate that we are committed to abiding by all the laws of the land and will continue to contribute to the national development by paying all applicable taxes. This entry was posted in Announcements and tagged Mustakbil.com, PRA, Punjab Revenue Authority, Sales Tax, Sales Tax on Services, TechnoBird on July 22, 2016 by waheed. We are pleased to announce our partnership with National Business Education Accreditation Council (NBEAC) – HEC for 3rd NBEAC DEANS AND DIRECTORS CONFERENCE 2016. Feb 2015 hosted by Institute of Business Administration, Karachi. Former President State Bank, Dr. Ishrat Husain Siddiqui and Dr. Mukhtar Ahmed, Chairman Higher Education Commission have inaugurated the ceremony. The Third Deans and Directors Conference is going to be held at Pearl Continental Hotel, Lahore on 17-18 Feb 2016.
the schools and with other key players influencing or being influenced by business education. Can business schools be the leading solution provider to the industry? Can business schools enhance the employability through entrepreneurship? What vision and strategy will deans require to successfully sustain their business school? Participants will address these and other questions in order to envision the future of business schools. i. To strengthen the business schools through industry academia partnerships. ii. To suggest ways to enhance research activities in business schools through partnerships. iv. To strengthen business schools through sharing ideas, resources and infrastructure. This entry was posted in Announcements and tagged Conference, deans & directors, hec, nbeac, PC Lahore on February 7, 2016 by waheed. Mustakbil.com partners with Facebook & Telenor to bring Free Job Search for people with no internet access. Mustakbil.com joins hands with Facebook and Telenor to launch Internet.org in Pakistan. From May 28th 2015, mobile subscribers (initially of Telenor Network) in Pakistan, will be able to access Mustakbil.com on their mobile devices through internet.org , without any cost. It is a great initiative by Facebook and the launch of Internet.org in Pakistan will open the window of opportunities for over 136 million mobile subscribers in the country. Internet.org will not only help users to gain access to education and health information, and valuable communication tools, but will also help a work force of over 60 million to keep themselves updated about latest career opportunities through Mustakbil.com. Our partnership with Facebook with respect to internet.org depicts our commitment towards providing a secure, reliable and more informed platform for jobseekers in Pakistan and to bring fruits of the internet growth to the people of Pakistan; making internet more inclusive. All Telenor subscribers can go to internet.org from their cell phones to access Mustakbil.com. 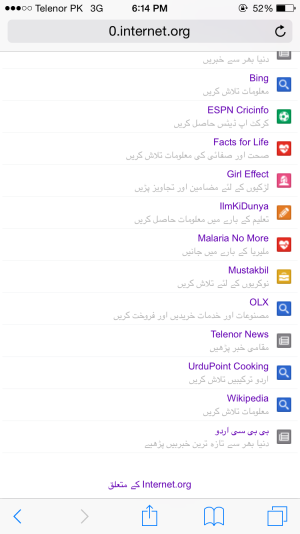 Open your browser and type “internet.org” to access a range of useful websites that users can surf without any charges, including Mustakbil.com. Both 3G and 2G users can access internet.org for free, and there is no need to subscribe or activate any specific service or package. 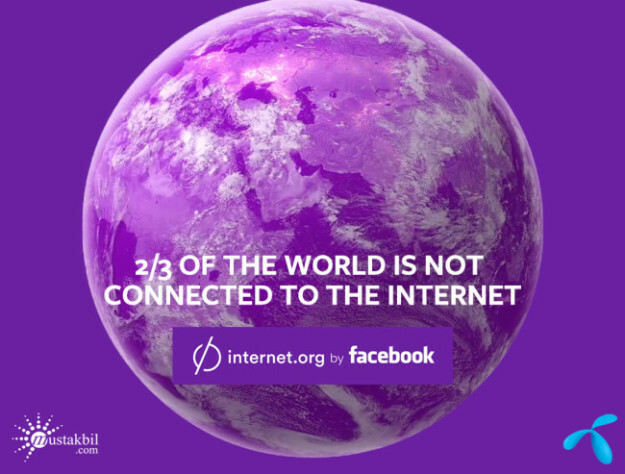 Internet.org is a Facebook-led initiative with the goal of making affordable internet access available to the two thirds of the world who are not yet connected and to bring the same opportunities to everyone that the connected third of the world has today. Telenor Pakistan is a provider of high quality telecommunication services in Pakistan since 2005. It has over 36 million subscribers, over 2400 employees and a nationwide network covering more than 8,000 cities. It holds a majority share in Tameer Micro Finance Bank Limited. Telenor Pakistan is 100% owned by Telenor ASA and adds on to operations in Asia. Mustakbil.com is a leading jobs site of Pakistan used by 50,000 employers and a significant number of active and engaged web users. It helps jobseekers in finding the jobs of their own choice, while providing a unique platform for employers to advertise different career opportunities available in their organizations and receive resumes from potential candidates online. After receiving resumes, Employers can drive the complete recruitment process using feature rich powerful tools provide by Mustakbil.com. This entry was posted in Announcements and tagged facebook, free internet, internet for all, internet.org, Job Search, Jobs in Pakistan, Mustakbil.com, telenor on May 28, 2015 by waheed. We are pleased to announce our partnership with UltraSpectra for Cyber Secure Pakistan 2015 Conference to be held from April 8 to 12, 2015 in Islamabad. Internet is now the most important part of our lives. Our work, social life, finances, research, reservations and other things are all dependent upon Internet. But the moment we connect to Internet, all this information become public. In computing world security implies as Cyber Security. Cyber security is made of processes and practices implemented to protect you which includes your networks, computers, programs and data from attack, damage or unauthorized access. Cyber Security helps us to stay protected while using internet. Cyber Secure Pakistan is the Initiative taken by Pakistan Information Security Association (PISA) in collaboration with UltraSpectra (Pvt.) Ltd. as management partner. The aim of the conference is to provide the platform for all the relevant stakeholders to get on board and converge the efforts in this space where a lot of efforts are still needed to be put in. The conference focuses not only to upgrade the technical capabilities through capacity building training for professionals but also contribute as awareness build up for general audience whoever has to connect to internet on daily bases. In each conference since 2012, all activities regarding Information Security for previous year are reviewed and activities for next year are planned. The conference is set to be held from April 8 to 12, 2015 in collaboration with NUST-SEECS. With more than 50 stakeholders on board this conference has become the preeminent Asian event for all stakeholders including Government, InfoSec professionals and Information Security entrepreneurs, telecom sector management and executives, banking sector and IT sector to share insight into the latest proven concepts, network with senior executives and establish lasting business relationships. Besides talking about the Cyber Security Draft tabled in the senate for legislative discussions, the agenda for Cyber Secure Pakistan is to seek all the national and international community including ICANN, APNIC, Internet Society, Google, regional CERTs and International researchers on the topic to come and share their experiences as well. Cyber Warfare is one of the hot topics for all the developed and developing countries. PISA-CERT is hosting 1st National Cyber Security Drill in collaboration with National Defense University (NDU) specialists. Capture the Flag is a Competition for Penetration Testers to test and improve their penetration skills. The main purpose of organizing this competition is to appreciate and support Black Hat Hackers to utilize their skills in Ethical Hacking. A reward will be given to the winner at the end of conference. This entry was posted in Announcements and tagged cyber, cyber secure conference, cyber secure islamabad, cyber secure pakistan, cyber security, Mustakbil.com, ultraspectra on February 19, 2015 by waheed. Mustakbil.com Partners With Launchpad Academy for its upcoming event “The Cross World Consumer Insight”. We are pleased to announce our partnership with Launchpad Academy for its upcoming event “The Cross World Consumer Insight” to be held on Dec 06, 2014 at NUST SEECS, Islamabad. It will be a one day event starting at 9am and finishing at 5pm. Three gurus of marketing world Dr. Russell Belk, Mr. Imtiaz Rastgar , and Mr. Moqeem Ul Haq would be sharing their experience based learning about opportunities , challenges , and approaches towards customer targeting. The session will proceed with Mr. Moqeem Ul Haq , Chief Strategey office – Ufone Pakistan, delivering his talk on building the consumer centric strategy. He will be succeded by Mr. Imtiaz Rastgar, Chairman Rastgar Engineering Co / CBI Expert Netherlands, discussing about key consumer attributes for globalization. Finally Dr. Russell belk who is considered to be authority on consumer behavior will share his learning about Qualitative consumer insights. All the participants of the seminar will be given certificates of participation at the end of the seminar. Looking forward to your presence on the seminar. This entry was posted in Announcements on December 3, 2014 by waheed.